Besides insulated concrete forms (ICFs), the other extremely effective system for green home design and commercial green building is structurally insulated panels (SIPs). 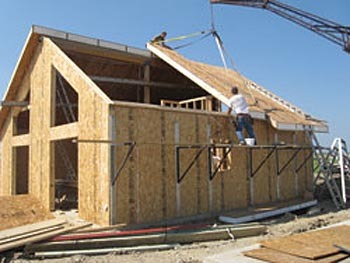 SIPs consist of two layers of a structural skin sandwiching a rigid foam panel in the middle. There are several types of structural skins, the most common being wood, specifically Oriented Strand Board (OSB), which is similar to plywood. There is also SIP panels made from steel and magnesium. There are many steel SIP manufacturers. The magnesium panel is a product of a company called OceanSafe, which was developed as a response to hurricane Katrina. These panels have received approvals from municipalities in the most active hurricane areas like Dade County Florida and southern Louisiana. The magnesium SIP produced by OceanSafe combines high wind resistance strength along with fire protection, which is a great solution for an area like Breezy Point where flooding, high winds and fire resistance is paramount along with energy efficiency. As we learned on Long Island during Hurricane Sandy, elevated houses see higher wind loading. SIP homes resist wind much better than stick-framed homes. SIPs have many of the advantages that ICF homes have, except the thermal mass. SIP panel construction is excellent for resisting air infiltration. Uninterrupted insulation is an aspect of both ICF and SIP homes that makes them so efficient. 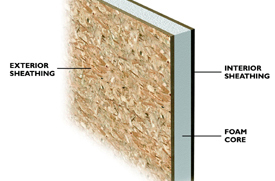 In stick framing, insulation is broken up every sixteen inches by the wall studs, ceiling joists or roof rafters.